Tottenham fought back to earn a well-deserved point against Arsenal in the first North London derby of the season. So how did they perform individually? The skipper’s cool head was vital during Arsenal’s sporadic spells of dominance. Lloris made a number of good decisions and was only slightly let down by his unreliable distribution in the opening stages. Not quite himself at the minute. The full back took a knock early on, which noticeably affected his accuracy and confidence. A shame as he was getting forward effectively as a right wing-back before the injury. Looked comfortable as the right-most of three centre backs. Won a couple of crucial headers and dealt with most Arsenal threats with minimal fuss. 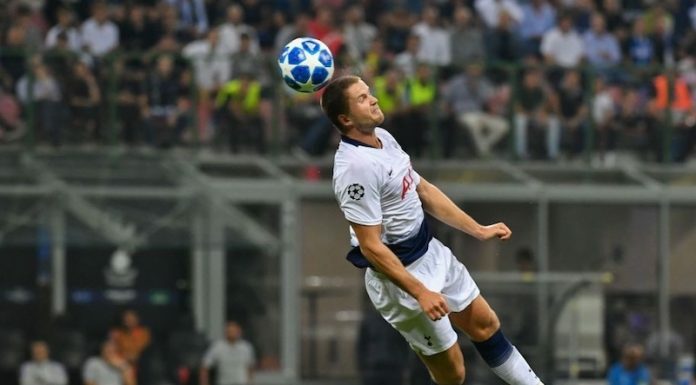 Was really unfortunate with the own goal, his only real error in a good performance considering the pressure he was under — this being Wimmer’s first Premier League appearance of the season. The best of the centre backs, Vertonghen superbly intervened during a number of dangerous Arsenal attacks. Brought the ball out from defence brilliantly on the left hand side, allowing more leeway for Danny Rose to get forward. Made up for Walker’s sub-par display with an impressive performance at left wing-back. Refused to pull out of challenges and was the first to get Tottenham up the pitch when the build-up play was too slow. The plaudits keep on coming for a player many are pleasantly surprised with. Expected to be a generic enforcer, Wanyama once again proved he can function as a defensive playmaker: breaking up play, making room for others and starting attacks. Back to his best after an iffy cameo in midweek that ended with an injury-enforced substitution. Dembele was majestic on the ball and was decisive in earning Spurs a point with his excellent run that resulted in a penalty. Misplaced a lot of passes in the first half and wasn’t involved as much as the supporters know he can be. But there were encouraging signs when Eriksen nearly made an impact after the equaliser, twice coming close to finding the net. Really needs a goal to get some fans back onside. Helped the team to no end by stretching the pitch for the majority of the game. If only his efforts on the ball matched those off it. Son’s final product was often wayward, and many will struggle to forgive him for pulling out of a 50/50 challenge with Petr Cech at 1-1. In terms of sharpness, he wasn’t quite at the races. But that doesn’t change the fact that Harry Kane’s return was perhaps the biggest factor in Tottenham’s change of fortune. Led from the front with command and desire, netting the equaliser confidently from the spot. Replaced the understandably tired Kane with twenty minutes to go and looked just as unfit. That said, patience must be afforded to 22-year-old playing in only his second top-flight season. Came on for Walker with ten minutes remaining. Did little wrong and was unfortunately ruled offside before a promising opportunity could unfold. I suppose on the plus side getting a point at the Emirates is not bad. I didn’t watch the match, apparently we played 3-4-2-1 (defensive in nature) and edged the possession. Looking at the stats the formation didn’t change anything, only three shots on target one of which was the penalty. Our heat map further confirms the lack of penetration to the opposition box. How on earth does Pochettino expect to win games if we can’t maintain pressure and create in the final third and if you still need convincing take a look at Chelsea and Liverpool’s heat maps and then you’ll understand why they scored 5 & 6 goals respectively. But the difference is, Nick, not one of the Spurs team that played yesterday would get in either squad, with perhaps the exception of Lloris although he’d have to improve his kicking. The only other player is Toby and he’d get into anyone’s team. Chelsea have a dearth of attacking midfielders who can make things happen and score goals (Hazard, Pedro, Moses, Willian, Fabregas) as do Liverpool (Mane’, Coutinho, Firminho, Lallana, Origi). We can play pretty football up to and around the half-way line but nobody with the killer pass or guile to create further up the pitch. I’ve long felt that Dembele would be much more productive if he was allowed to push further forward, as he did at Fulham. But until we can start paying the mega-bucks that the top teams can afford (maybe after a couple of seasons in the new stadium), we will not be buying the likes of Hazard and Coutinho. Point taken and agree with Dembele playing further forward. I just wish Pochettino would at least try 2 upfront, especially at home.